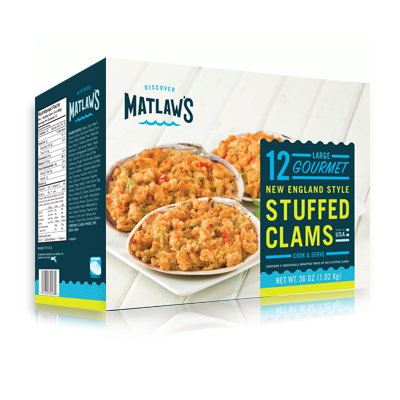 The generous 12-piece “Club Pack” of Matlaw’s jumbo-sized, Gourmet Stuffed Clams are served in a natural shell and loaded with a classic blend of golden breadcrumbs, succulent chopped clams, minced celery, red and green peppers; and sprinkled with paprika and parsley. They’re sure to impress seafood aficionados and turn seafood skeptics in to raving fans! For food safety and quality follow cooking instructions. Cook to 160°F internal product temerature. 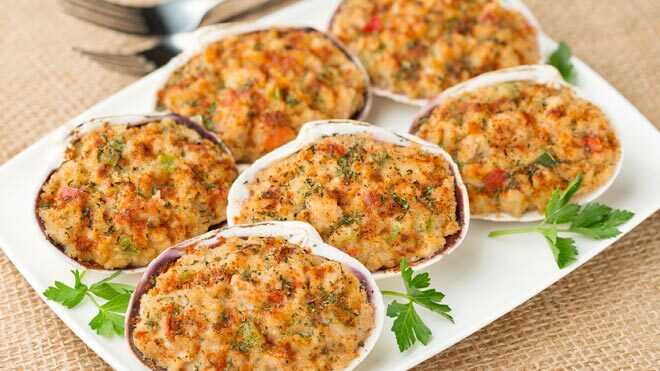 CONVENTIONAL OVEN: Remove clams from tray and place on a baking sheet into a preheated 450°F oven for 30 minutes. ON THE GRILL: Wrap clams in a foil pouch; leave the top open for a crispy top or closed for softer, moister clams. Cook on medium heat for 25 minutes with lid closed. MICROWAVE: Place 2 clams on a microwaveable plate. Cook on HIGH for 4 minutes. Not recommended to cook more than 2 clams at a time. Product was tested using an 1100 watt oven. Cooking times may vary. CAUTION: Product will be very hot after cooking. Refrigerate or discard leftovers.